I found this picture the other day linked off of Digg. I dont know where the photo orginally came from as there was no picture credit listed, but it's so cool I thought I'd share. I liked it so much and I wanted it as a wallpaper so I did a little Photoshop and presto made the wallpaper. The original image is justified all the way to the right and everything you see to the left is hand made in Photoshop by me. I didnt clone anything, except the water drops I made by hand. The branch could be a little better on the sharpness but it's pretty much where it needs to be. Enjoy! Its far too busy on the left. I would have rather seen you extend the background and the stick, and not put soooooo much water droplets in. 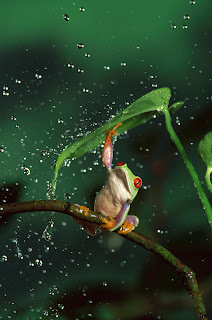 It looks like he has shaken a impossible amount of water off the leaf. I would have trailed them off about half way and left the other side a bit empty for contrast. As usual, your photoshoppery is top notch. Since noone credited the photographer of the original picture in either the digg post, or in your's, I will go ahead and link his site here. 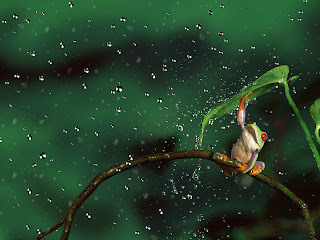 I wanted to recreate the rain downpour around him, not necessarily coming off the leaf, but you're right it does end up being a bit busy. Thanks for posting the link to the guy's site. I was reticent (haha eat it Joel) to post the pic or my photoshop without the credit to the photographer at first and I sat on it awhile. But I couldnt find his site. Glad you're crazy finding skills were able to snag it. Woot! yeah, it was in the comments of the original digg article. His site is worth a visit just for some of the other really cool nature pictures. In your version, the droplets to the left kinda look like they are coming from all directions, not so much down like rain. But its a tough photo to shop. I hear you about being afraid to post it, because I had seen the frog picture when it first hit digg, and noticed that all his pictures had a big ol' copyright with his name watermarked on them. Personally, when I start to post some of the macro work I have done recently, I will probably do so under a creative commons license.. Damn you and your 'reticent' word! Tee Hee. Wow, good memory!